I've actually had it for about a year and have tinkered with it enough to turn it into a pretty good rider. Just got back from a trip to Bike Week in Daytona. What a Hoot this bike was. But I have too many toys, and too many trips I want to make this year, so this one has to go. This is my personal website to share my hobbies with others who have the same interests. 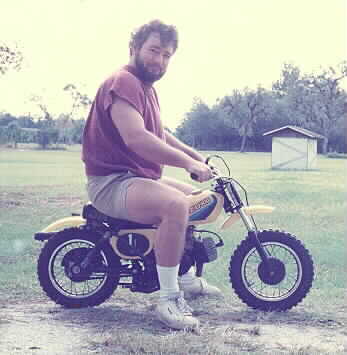 I started out with a Sears mini-bike when I was eight. My first real motorcycle was a Yamaha GT-80 in 1972. I started racing that bike in the AMA mini-cycle series against the likes of Jeff Ward and others. I then moved up to the 125 class on a CZ of all things. The first purpose built motocross bike I owned was a 1974 Honda CR125 Elsinore. Now that was a heck of a motorcycle. I raced that bike for two years and had a blast. In 1976 I traded the Elsinore in on a 1972 Yamaha R5, my first real street-bike. 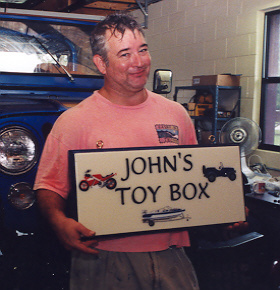 That's how it all started, and I now have a small collection of some of my favorite motorcycles and cars. We built a new garage in 1993 that I thought was big enough to never fill up, but of course I was wrong. 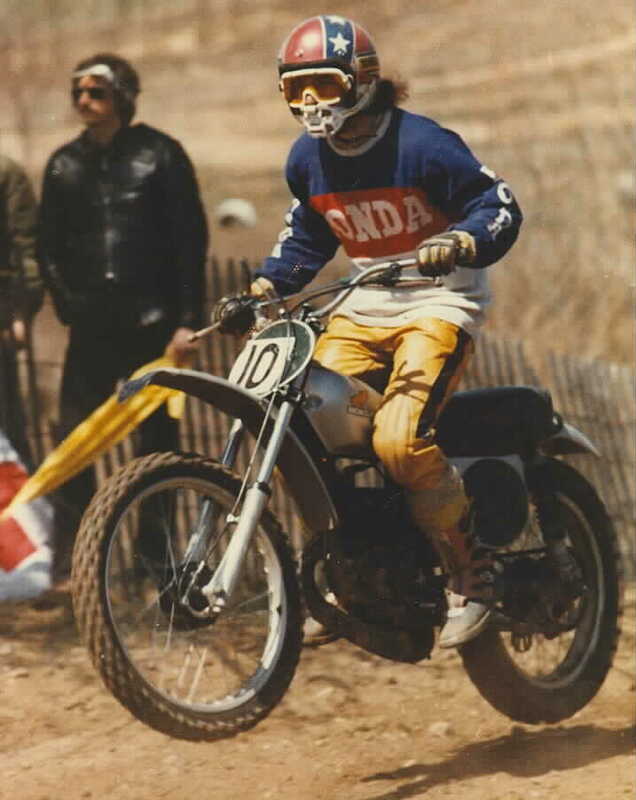 Photo below taken in 1974 at Brighton Motocross Park in Michigan. 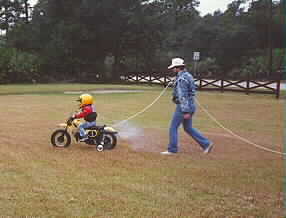 My son, Race, has also become involved in motorcycles. This is his first motorcycle, a JR50, when he was only three years old. Of course, the photo on left is me, and it's Race in the middle on his first ride! I'd have to run behind with the rope as my emergency brake. The picture on the right is of Race on a trip up the BRP a few years back on his most recent bike, a 2007 VFR800. He's grown quite a bit from that little boy on the JR50 so many years ago. Me and Mrs. Motorcyclefanatic (aka Barbara) below, sitting on the porch at TWO in Suches, Georgia. One of our favorite destinations on one of our favorite roads, Hwy 60 from Morganton to Suches. She's become quite the enthusiast in her own right, her m/c stable now includes a '78 Yamaha D175, an '89 Honda VTR250, and an '84 Honda VF500 Interceptor. I also enjoy jet-skiing, boating and classic cars. Take a virtual tour of my site for a look. Feel free to contact me.